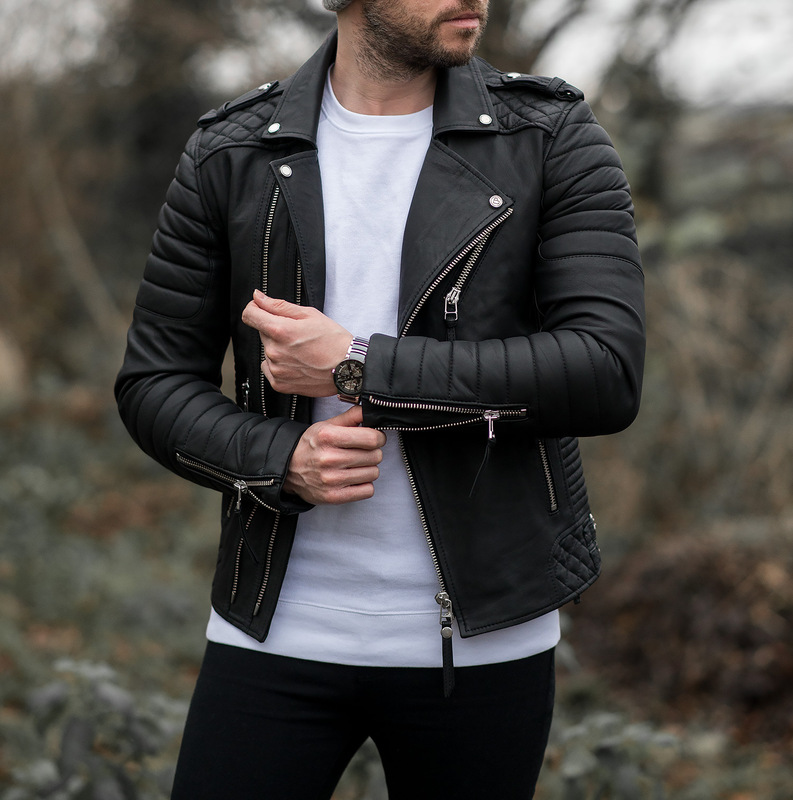 It’s time for another review on my mens fashion blog, so for my latest entry I will be looking at the Mens Boda Skins Kay Michaels Leather Jacket in Black. I got it a few months ago and have been loving it! I have owned the Antique Creased Brown version in my collection for almost a year now (reviewed here) yet I was never 100% satisfied, not because of any negatives with the jacket, but because the black model was always looming in the background, tempting and teasing me! I originally opted for the brown because it was a limited run and that I’ve always preferred tan coloured leathers. But as the year progressed, I couldn’t help but be drawn to the classic black model. Finally, all of my defences were broken down and I made the purchase! But was it the correct decision? 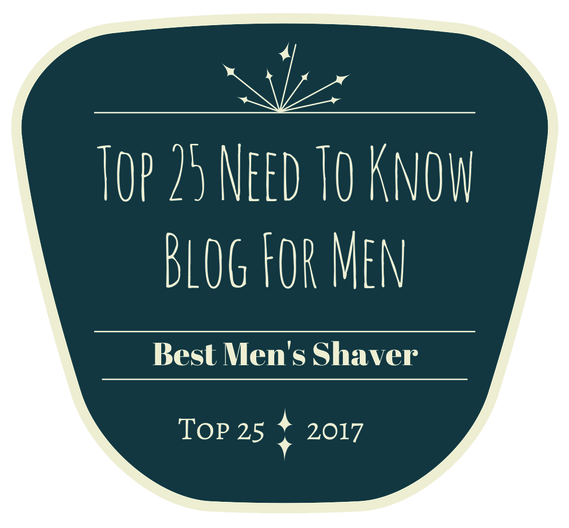 Find out in my review! The Boda Skins Kay Michaels Leather Jackets have based their design on the classic biker style, something which is seemingly timeless. 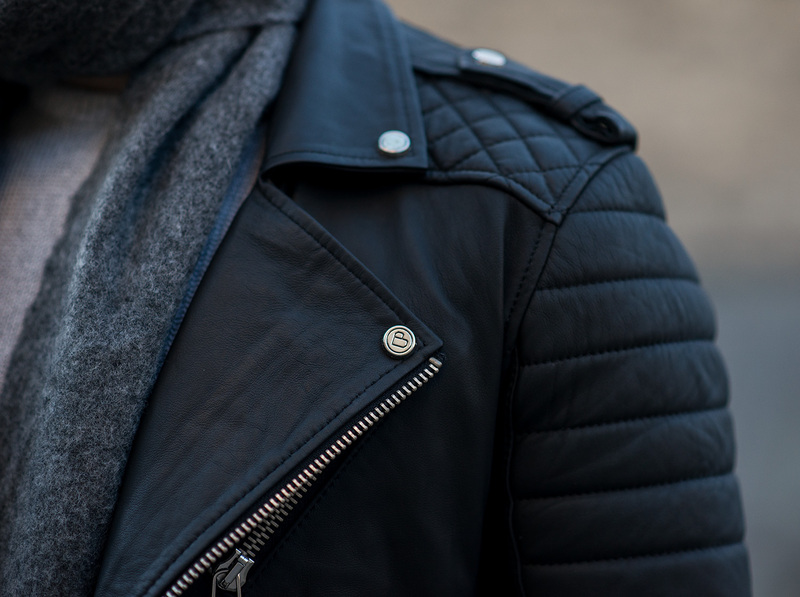 Ever since biker jackets were first created they have gained legions of fans throughout each passing decade. The Boda Skins team are no fools, adopting this same classic look for their flagship piece, yet adding their own unique additions and details. 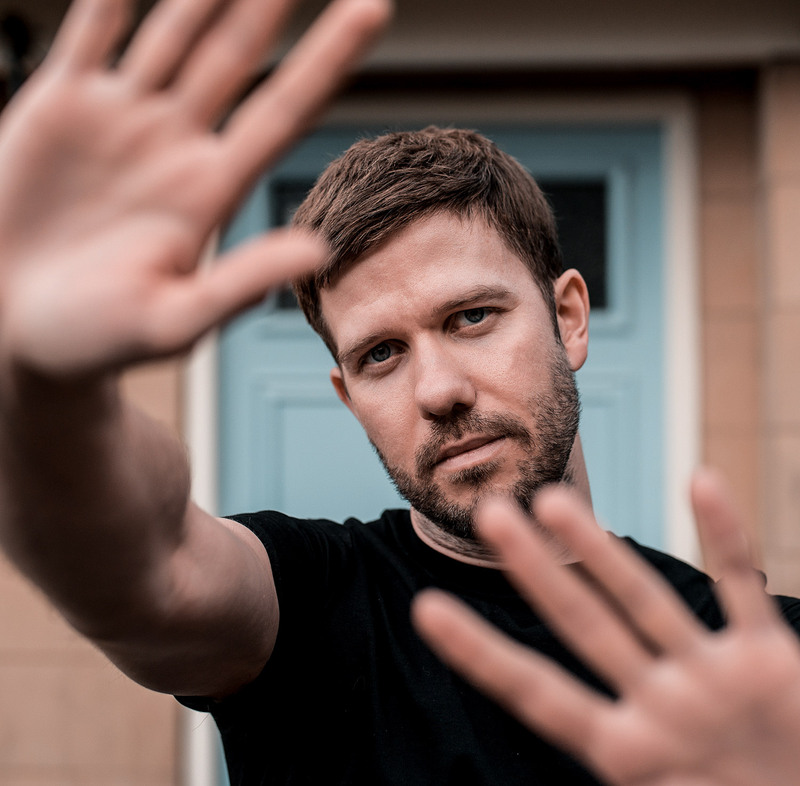 The most easily noticeable feature is the heavily padded upper arm sleeves, this is what easily sets them apart from rival brands and also what makes Boda Skins jackets instantly recognisable and so attractive to look at! The black leather looks deliciously expensive, almost a matte colour rather then the deep and dark (and sometimes shiny!) leathers usually on offer. As mentioned, the leather looks high end, but upon touching, it feels expensive too! Incredibly soft and supple, particularly the iconic arm padding and the overall feel of the fabric. Fortunately the leather doesn’t have the side effect of being delicate, worrying about damaging your newly acquired jacket can play havoc with your outfit choices! 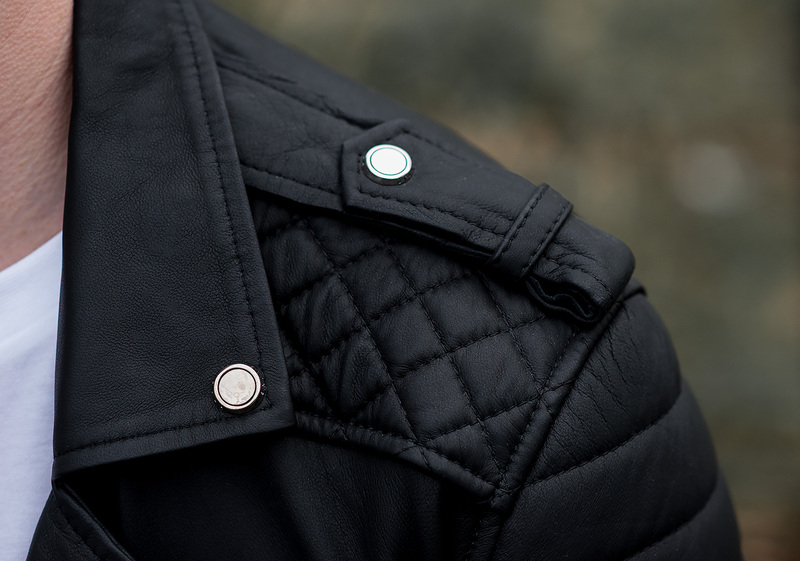 The jacket is covered in little details, Boda Skins logo branded studs, quality zippers with made to last pullers, an internal iPhone pocket, and the unobtrusive English flag patch on one of the arms. These little subtleties are what reassures you that you are witness to a quality product! 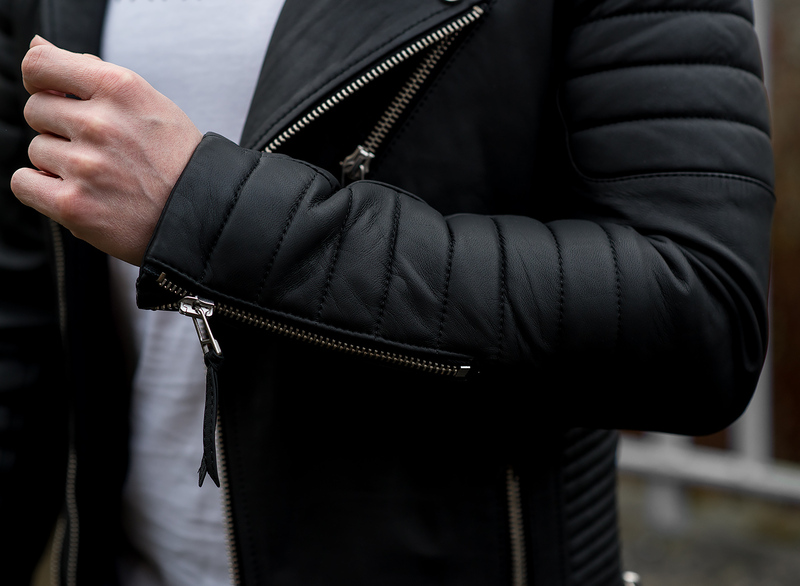 Biker leather jackets are an iconic style, one of the few types of clothing which complements almost anything in your wardrobe, the Boda Skins Kay Michaels is no different. Paired dressed down with distressed skinny jeans and sneakers and a crisp white T Shirt or slung over the top of your smart shirt and tie, creating an eye catching combo. Thankfully when it comes to regular wear, this jacket pretty much nails it. With its internal soft padding and buttery feeling leather, you won’t ever feel uncomfortable. It’s a jacket that I can happily wear all day and not feel too restricted. I chose my normal size of a XS for this Boda Skins jacket (the exact same as my Brown Version) and it boasts an exceptional fit, nice and snug in the arms and shoulder area (without constriction). The sleeve lengths are close to perfect, suitably sitting across my wrists. Compared to other rival brands (like my Allsaints Cargo), the fit of the Kay Michaels jacket is just how an XS should fit. Top marks from me in this section! Regarding the length of it, it also comes in a tall version if you’re on the taller side (see here). The price of the Boda Skins jackets are very close to stepping into the designer brand price bracket, with yearly increases (just like all brands), this gap will only get smaller. However, despite its admittedly big price tag of £459, I strongly believe this jacket is worth every penny. Smashing past its similarly priced competitors as it’s made to last and comes with a 100 year guarentee. My opinion of this jacket was always going to be a foregone conclusion (after all, I already highly rate the brown model!). Excellent style and design, super soft leather, perfect fit and just beautiful to look at! This leather jacket is one of the best available, it’s no surprise the brand is going from strength to strength! 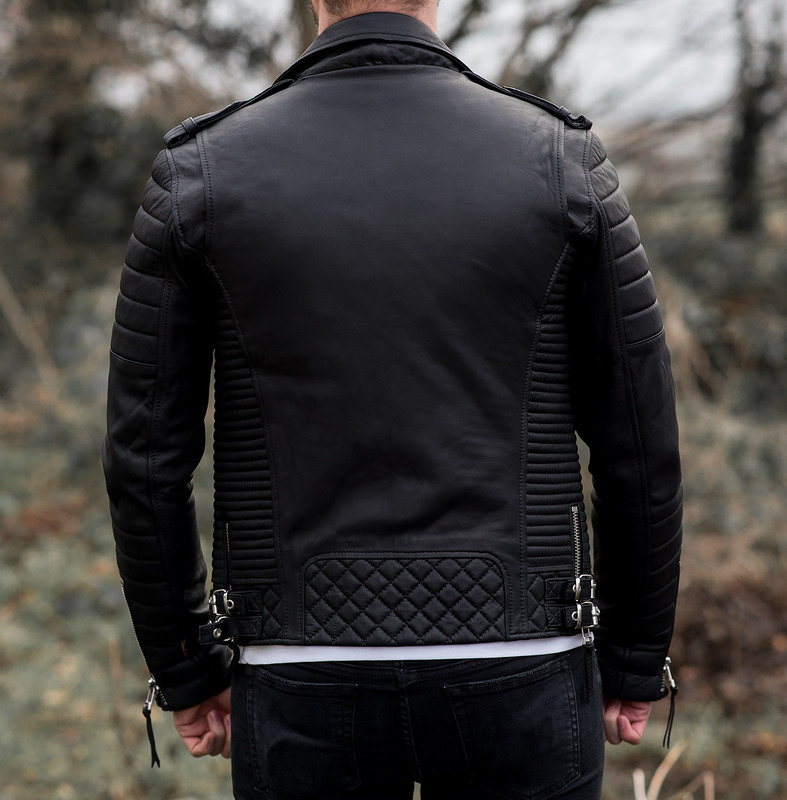 The Kay Michaels has become iconic now and one of the most beautifully designed leather jackets I’ve seen, especially with all the quilting and zip detailing. 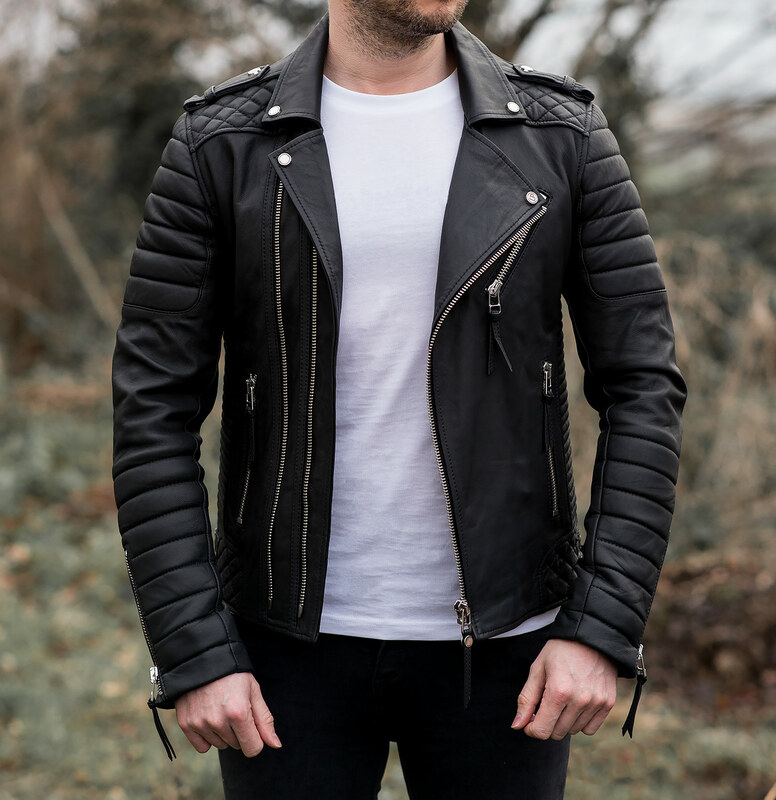 What do you think of this leather jacket? Is it something you would wear? Please let me know in the comments below! I can also help with sizing and comparisons if you need it. You said that you got the XS(UK) right? Sorry, but how tall are you? I’d just like to add that if you want to wear a hoodie underneath say the “Dragon hoodie 2.0” from Boda skins then you will need to go up a size higher then you would normally else it’s just t-shirts that will fit. Hey Wayne, honestly since I’ve owned the jacket it hasn’t really stretched at all! I haven’t worn it a massive amount of times, but as a comparison, my Allsaints Cargo has stretched a lot for the same amount of wears. But then on the flipside, these jackets are quite slim, particularly in the arms and shoulder area. Is it an option to order both and return one? Yeah, it is the shoulder and arm area which is the tightest part. They should allow you to return them. I have seen plenty of fitness guys who do wear their jackets though, it’s just trying to get the correct one! I am a 44 inch chest and I couldn’t get into an XL I went XXL and even then the arms are very snug and I can just about do it up. An XL I’m guessing would be too small for you especially if you wanted to wear anything other than a t-shirt underneath. Hey Mark, that is a good point, I’ve never worn mine with anything other than a T-Shirt … I wouldn’t be able to get it on with a jumper! Do you know where I could get the bordeaux version of this Kay Michaels? There are quite a lot of variations of the Kay Michaels. Is this the one forthis review? Regarding the bordeaux version, usually if they are gone from site, then it’s no longer available. You can always check eBay? Sometimes they do have pop up shops, when they sell a bunch of older stuff. Is This jacket the Kay Michaels Platinum version? 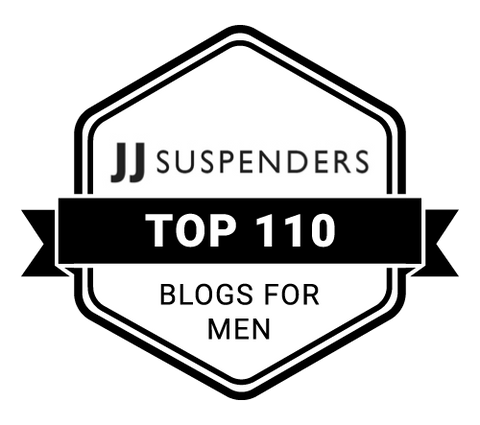 Hi Matt, looking at their website, they do recommend a US M is a UK S.
But they are very slim, particularly in the arms, anything thicker than a T-Shirt and I probably wouldn’t be able to get the jacket on! Maybe if you plan on mostly wearing hoodies or sweaters, you may need to size up one? I cannot agree with you more!… I absolutely love both my Kay Michaels jackets!…. classic motorcycle (gold hardware) and the Queens Guard (black hardware). Both fitting exactly to size (38) I have been stopped dozens of time asking me about my jackets, and tell each one of the admirers where to find and get one of their own!… Thank you for your great review as well!… Cheers mate!😉…. btw.. if anyone has the opportunity to go a Bodaskins “pop-up”… I highly suggest going… fun to try on the entire collection! Hi Robin, happy you like the review! Yes, my Bodaskins jacket is my favourite brand for leather jackets! One day I will manage to get to their pop up shops, they look a great place for a bargain! Great review, I am planning on buying this leather jacket, but am unsure about the size. I am 5’10”, chest is around 37-38, slim build, should I be getting XS or S? Will S be too big and length of sleeves be a lot longer than XS? Thx! You sound a similar size to me and I like the slim fit of the XS, however I can pretty much only wear a T-Shirt with it (especially because of the arms and shoulders part of the jacket). Usually an increase in size in clothing will give you a slight increase in sleeve length too. Are you able to wear any long sleeve shirt or light sweater underneath the jacket? I’ve never actually tried, I reckon I could fit a thin material sweater underneath. One question.. are you able to zip up the jacket? I guess you probably could but would be very snugged / tight, correct? Hi 🙂 Glad you liked my review! Sorry I missed your comment before, it went in spam. I can zip it up, but as you said, it’s very tight, so it’s not very comfortable. 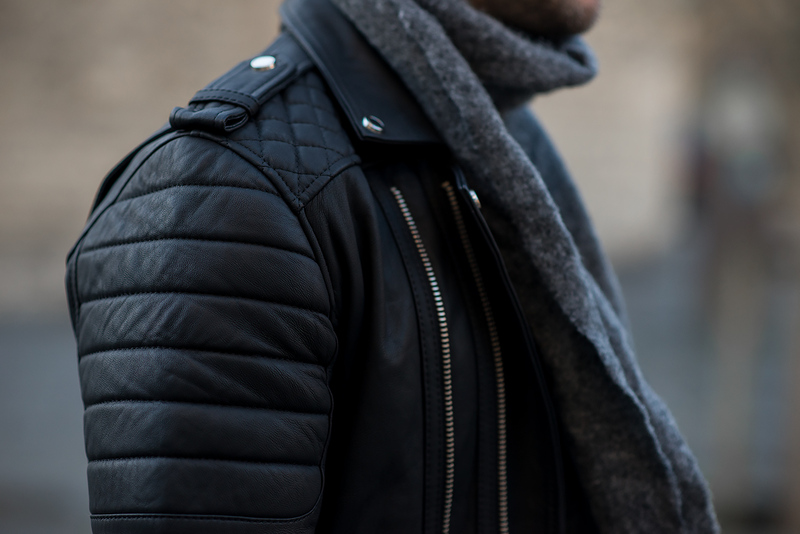 I find that leather biker jackets look better undone anyway! Do you have any other questions? I just bought this jacket in size XS. I think it fits good, but am concerned that the jacket may look too short on me. Does this jacket fit a little shorter than all Saints cargo (I have that one in XS as well)? Do you mind if i send you a few pictures for your suggestion? I highly value ur opinion when it comes to fashion :). Thx! Yes, for me the Boda does sit quite a bit shorter on me compared to my Cargo too. Hi just curious I am 5,6 would the length of the jacket fit me or would it be too long? Hi Bryan, difficult to say, it would depend how long your torso is. I’m around 5,9 and it sits nicely at my waist level. Nice review about this beautiful jacket. I’m about to order one kay michael and one royale. I read you are around 5.9 wich seems to be near 1m80 ( metric ) and wear an XS. As you seem to be 10cm higher than me, should i be worried about even the XS too large for me ?